Immerse yourself in a CHILL whole body cryotherapy treatment. 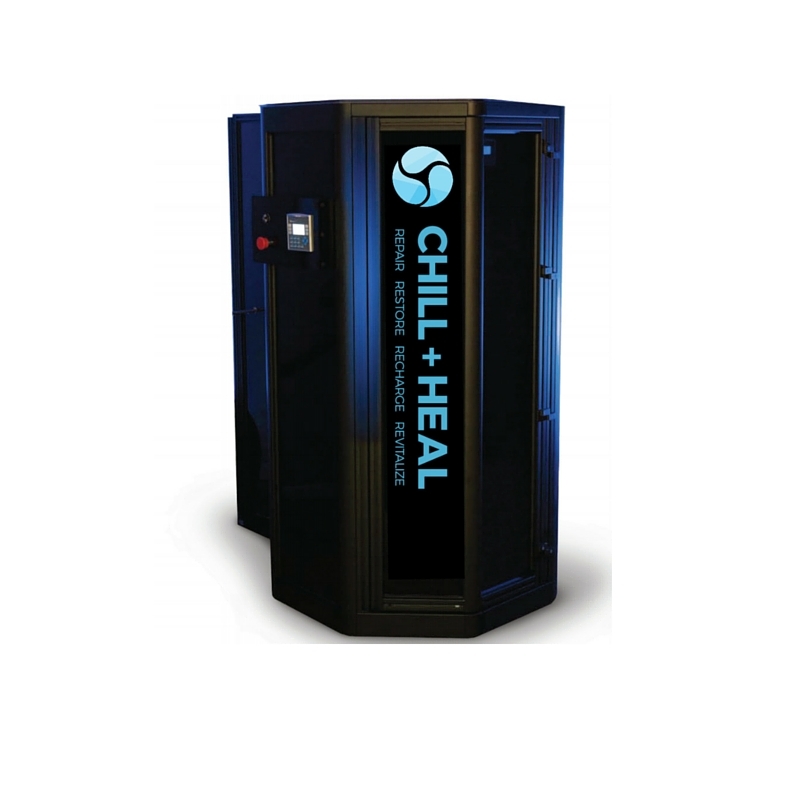 Shreveport Cryotherapy Spa Chill + Heal are the proud owners of the IMPACT Cryotherapy Spa. Using our Impact Cryosauna (read more here about why we love Impact Cryo), your body will be exposed to temperatures of -202 degrees Fahrenheit in order to promote overall health, fitness, weight loss, recovery, as well as beauty. The treatment lasts a maximum of three minutes. Once out of the chamber, the body immediately reheats. Whole Body Cryotherapy is the practice of using cold temperatures to promote natural healing and wellness that dates back to ancient civilizations. Whole body cryotherapy is the modern application of that treatment which stimulates the same rejuvenating and refreshing benefits at a whole new level of cold — in just three minutes. Athletes enjoy cryotherapy, and some have even stated they feel like they get a better post workout recovery and love the pre workout adrenalin they feel it produces. Clients state they feel energized for hours after their sessions. Impact’s patent-pending whole body cryosauna fills with nitrogen vapor to drop the ambient temperature to a range of -110 Celsius (-166ºF) to -130 Celsius (-202ºF). This temporary dry chill penetrates only the outer-layer of skin and cues your evolutionary bio-responses to extreme cold. A single three-minute refreshing session promotes the natural healing process. Not only that, but cryotherapy has also been said to help with decreased skin blemishes, tighter skin, and some clients report stronger and longer hair and nails. Many whole body cryotherapy clients have stated they get that “runners high” or “euphoric” feeling after a Whole Body Cryotherapy session. Past cryotherapy clients have stated that they feel euphoric and energized for up to 8 hours. It’s also not unheard of to have a deeper and more restful sleep following cryotherapy sessions. A deeper sleep allows you to recharge as well as improves your overall mood and well being. After several Whole Body Cryotherapy sessions, clients have reported feeling more energized and with a renewed vigor once starting a multi session cryotherapy program. Once you feel renewed energy and a more restful sleep you will want to make Whole Body Cryotherapy a regular part of your routine. We will work with you based on your reasons for seeking cryotherapy to help tailor a specific plan for maintenance. This phenomenon started as early as 2500 BCE with the Egyptians. The Greek physician Hippocrates even wrote about the pain-relieving benefits of snow and ice. Napoleon’s legendary surgeon used it to help facilitate amputations. In 1845 and 1851, Dr. James Arnott of Brighton, England, described the benefits of local cold application in the treatment of numerous conditions. However, it was 1978 in Japan that Whole Body Cryotherapy was developed and used for the treatment of Rheumatoid Arthritis. Over the last 30 years it has been studied and refined, and many European countries cover the treatments with Medical Insurance Policies. It wasn’t until the last decade that Whole Body Cryotherapy made its way over to the United States and the therapy exploded onto the market. Since then, numerous professional athletes and professional sports teams have used Whole Body Cryotherapy to enhance performance and decrease recovery times. You can read more about Whole Body Cryotherapy on our FAQ page. *These statements have not been evaluated by the FDA. These products are not intended to diagnose, treat, cure, or prevent any disease. Just like with diet or exercise programs, you should check with your physician before using cryotherapy.